A player will die in an NFL game. Maybe not in Week 1, maybe not by Week 8 and maybe not by the end of the season – or next season. But in the next four years? Well, I wouldn’t be surprise if a player lies on his back on the field with 75,000 witnessing his last breath. I’m not being mean. Or sadistic. I’m being realistic. And I’m following what’s happened to the New Orleans Saints with half of me in shock and the other half not at all. Money for taking an opponent’s top player out? 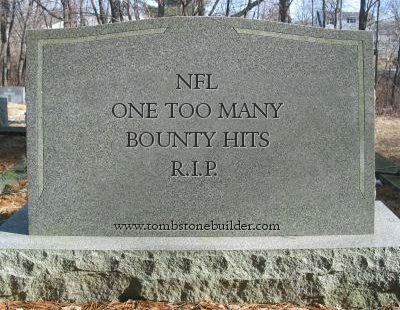 I don’t believe the Saints were the first team to have a bounty system and probably won’t be the last. Football is essentially a kid’s game played by men who get paid like they run Fortune 500 companies. And you don’t get the fattest paycheck by being nice. You get it by physically imposing your will on the man inches from your facemask. Players aren’t getting slower or smaller – they are getting bigger and faster every year. The field isn’t getting bigger, either. It’s basic physics: The more bigger, movable parts you confine in the same-sized space the more collisions will occur. It’s like playing bumper cars, except you’re not in those cute tin boxes that move at a snail’s pace – you’re in monster trucks moving at full throttle. Certainly, crashes will occur, but they are much more severe. Stanford’s Andrew Luck and Baylor’s Robert Griffin III have dominated the buzz leading to the NFL Draft, but not all of it. That’s because there’s a 21-year-old defensive tackle out of the University of Memphis named Dontari Poe. He’s 6-foot-4, weighs 346 pounds, runs 40 yards in 4.98 seconds and can benched 225 pounds 44 times, more than any player in Indianapolis this year. He’s projected to be the top defensive tackle taken. The first defensive tackle in the 2007 draft was Amobi Okoye, a 6-foot-2, 302-pounder out of Louisville, which meant he was 14.5 percent lighter and 2.7 smaller than Poe on draft day. You can’t blame players for being physically violent. If providing for my family meant knocking a ball-carrier so hard his family tree shook, I wouldn’t hesitate to do it. I would expect you to do that to me, too. Players have to know the risks they are taking by playing America’s Game. And since they have no problem cashing their game checks – have you ever heard a player say, ‘I had a terrible game, coach, so you just owe me 50 percent this week’ –I have no problem with them getting hurt. I don’t want to see it, but I’m not going to cry when I hear they move like they’re 80 when they’re in their 40s. They made the choice to play football. They knew the risks, so they get to enjoy their huge salaries, but also having to deal with the huge damage to their bodies when the game discards them. I mean, if I smoked for 20 years and got terminal lung cancer, would it be surprising? If Big Mac and Champ Burger were my lifelong friends and I died of a heart attack, would it be shocking? No and No. Football is violent enough without players trying to get a few more Ben Franklins for injuring the opponent’s best player. But the Saints – and any other team that has, or had, a bounty system that we don’t know about it – were trying to turn the sport into a spectacle. So Commissioner Roger Goodell stopped it and made the Saints pay like they were starring in a MasterCard commercial. That cheap shot on Brett Favre in the 2010 NFC Championship Game? Take a one-year, break Sean Payton – and no, you don’t get your $5.8 million in salary. Gregg Williams can start preparing for the 2015 season for all I care. That ridiculous hit on Kurt Warner the previous game? Cost: Two second-round draft picks and giving general manager Mickey Loomis having plenty of time to chill at Pat O’Briens to chug hurricanes. Teaching a lesson to all the other Saints who were targeted like prey: Owner Tom Benson is $500,000 lighter in the wallet. Showing the Saints and the rest of the NFL it doesn’t pay to play like thugs: Priceless.